Telling stories, counting, recognizing written names and potty training are some things that the children in The Monkey Room are working on. The Monkey Room was designed to provide exceptional care for children aged two years to two and a half years. Enrolled families can expect a safe, secure, nurturing, and age-appropriate learning environment. Experienced, well-qualified teachers are staffed at a generous 1:6 ratio. Teachers are dedicated to responding promptly to every child’s feeding, sleeping, toileting and playtime needs. Families are provided with daily written reports that accurately summarize the child’s daily activities. In addition to communication at drop off and pick up, families are encouraged to call or visit as desired. Children in the Monkey classroom continue to practice consistency by following a daily routine. Teachers foster growth by introducing new experiences through creative play and exploration while encouraging children to learn. 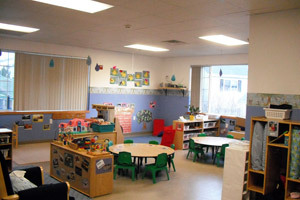 Jennifer Koch has been working with infants, toddlers, and twos at Here We Grow since November of 2005. Her experience goes back quite a while, having worked in the childcare field since 1994 when her first son, Joshawa, was born. Some of Jennifer’s certifications include Infant/Toddler, CPR/AED, SIDS and Shaken Baby. Jennifer also finished her Associate’s Degree in Early Childhood Education. It is her goal to make the Monkey Room a place that children feel safe, happy, and loved, enabling them to learn and play freely. Jennifer grew up in Poynette, WI with one younger sister. After her second son, Jacob, was born in 1998, she decided to move to Verona, where she still resides. Outside of work, Jennifer enjoys watching movies, reading books, walking, camping and spending as much time as possible with Josh and Jacob. Tyler Bingman, co-lead teacher in the Monkey Room, previously worked at Here We Grow from 2011-2015 as a float. Tyler left HWG to work at Lions Eye Bank of Wisconsin, however after his son Declan was born, he wanted to find a job where he would be able to spend more time with his family. He started back at HWG in July of 2018 and is excited to be back working with kids and also being able to watch his son grow. In his free time, Tyler enjoys hiking, rock climbing, kayaking, spending time with his family and friends as well as traveling. He has traveled to Italy, France, Germany, Switzerland, Scotland, England, Canada and Mexico. He has also visited 47 out of the 50 states.